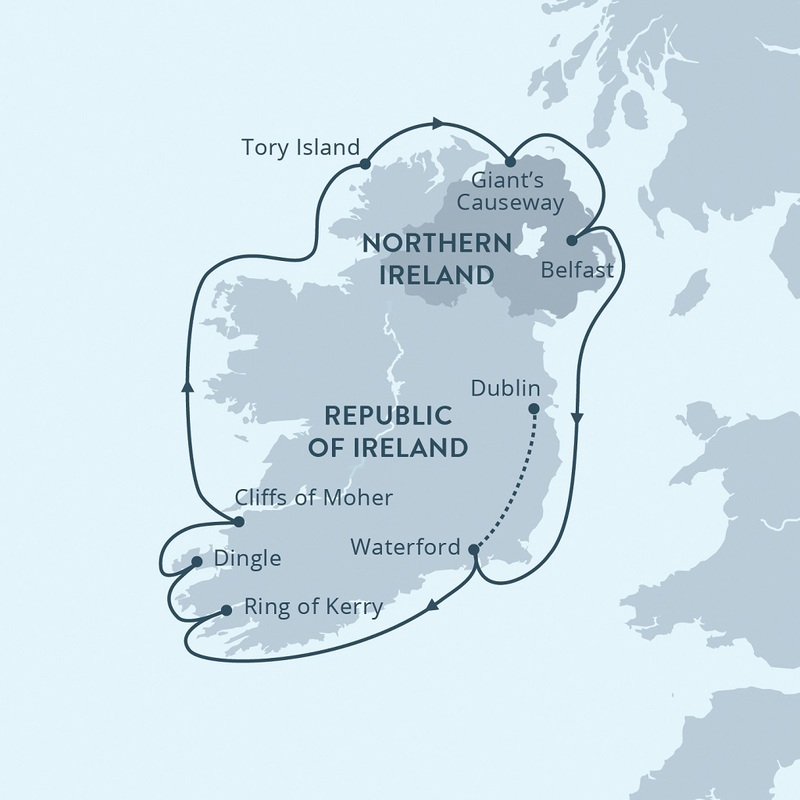 Ireland Circumnavigation Cruise – The Great Canadian Travel Co.
2019 European Expeditions Savings: save 15% on one or 20% on two or more European expeditions to Ireland, Scotland, Iceland or Iceland to Greenland. Offer expires 15 April, 2019. (see Tour Notes for details). Everyone loves Ireland! Friendly folks, rolling countryside, charming villages and rugged seascapes. The Emerald Isle is truly a treasure and one best seen from the sea. Irish culture is vibrant and welcoming. Visit quaint villages, harbour towns, and modern cities. Meet the people, hear the stories—and tap your toes to the music! Sail past the rugged Skellig Islands, featured as Luke Skywalker's base in the film "The Last Jedi"
Sale discount will be applied to the berth cost only for 2019 sailings. Regular prices are listed below before any discount has been applied. This twelve-day voyage aboard the Ocean Endeavour shows Ireland in its best light. This island nation has always embraced the ocean. From cosmopolitan Dublin to coastal Ulster, there’s so much to see by sea. Arriving independently in Dublin, you will make your way to the city centre to meet our Expedition Leader and fellow travellers. We’ll then explore the region, wending our way to our disembarkation point. On our last day together, we’ll wind up back where we began: Dublin. Ireland’s glorious capital—beloved of poets, musicians, and dreamers—lies at the mouth of the River Liffey. Once we disembark, you may enjoy exploring one of the world’s great cities. We can arrange for extra nights of accommodation in Dublin after this cruise ends, to allow you time to further explore this lively and historic city. Accommodation ranges from hostels, B&B/guesthouses, all categories of hotels up to castle stays. Please inquire. Alternatively, take our optional post-cruise tour around the Isle of Man, or depart from Dublin on to your next destination or journey home. 2019 European Expeditions Savings: save 15% on one or 20% on two or more European expeditions to Ireland, Scotland, Iceland or Iceland to Greenland. Offer expires 15 April, 2019. The discount is subject to final approval by the cruise line at the time of booking, and may be withdrawn without notice.